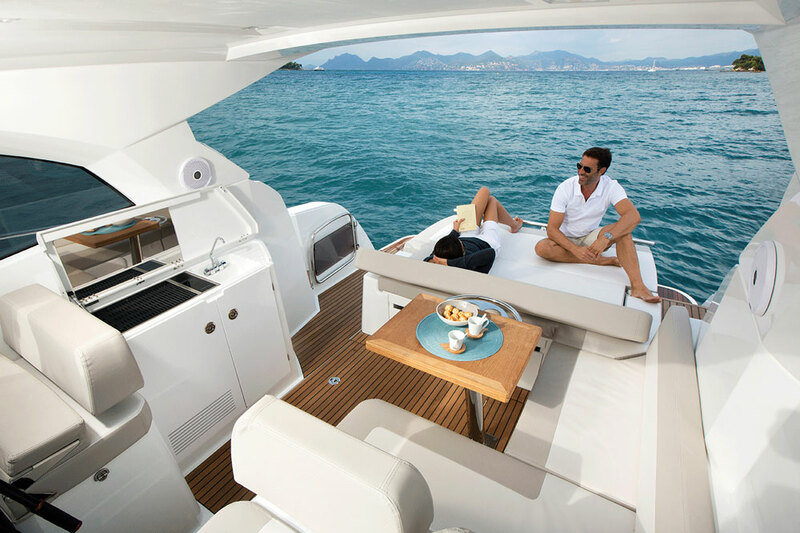 The newest express cruiser from Jeanneau is bound to please, in a number of ways. If you live in North America you might be surprised to know that Jeanneau actually has its roots in powerboats—not sailboats. In fact, the company built its first powerboat way back in 1957. But it wasn’t until the last 10 years that Jeanneau started importing power craft in any quantities to the United States and Canada. 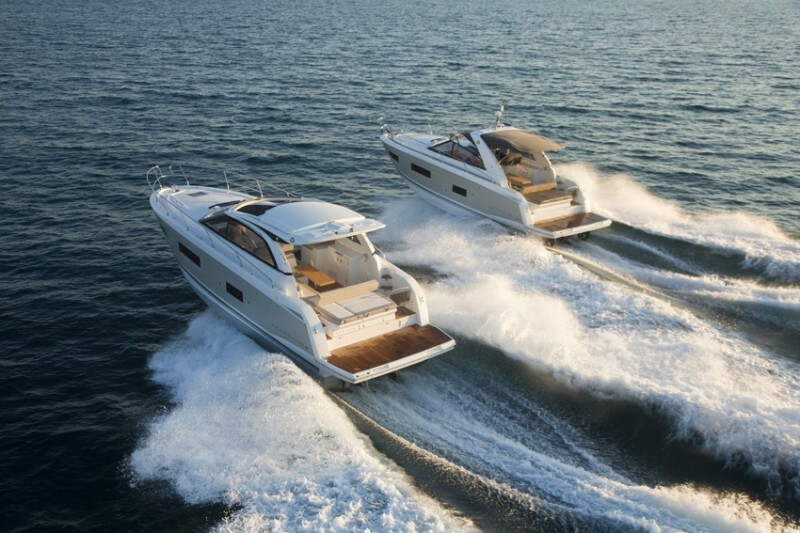 Today, however, Jeanneau has a robust lineup of more than a dozen powerboats for the North American market, and that doesn’t include its Prestige motoryacht brand. 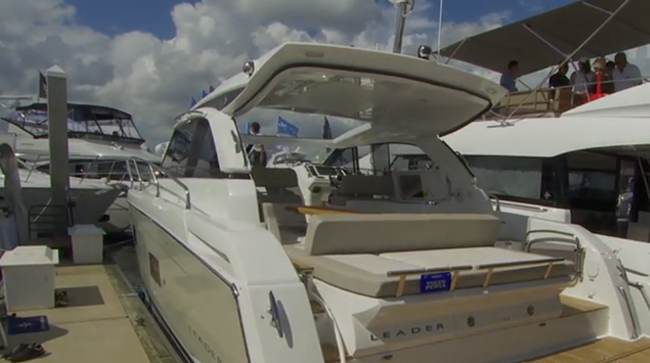 Today we’ll have a look at the Leader 36, an excellent addition to its already good express boat lineup. 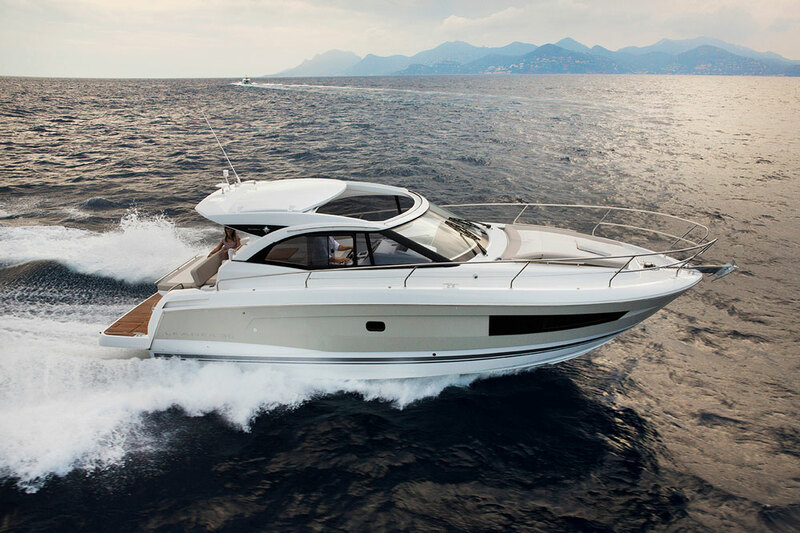 The Jeanneau Leader 36 has an abundance of good looks, performance, and innovative design elements. 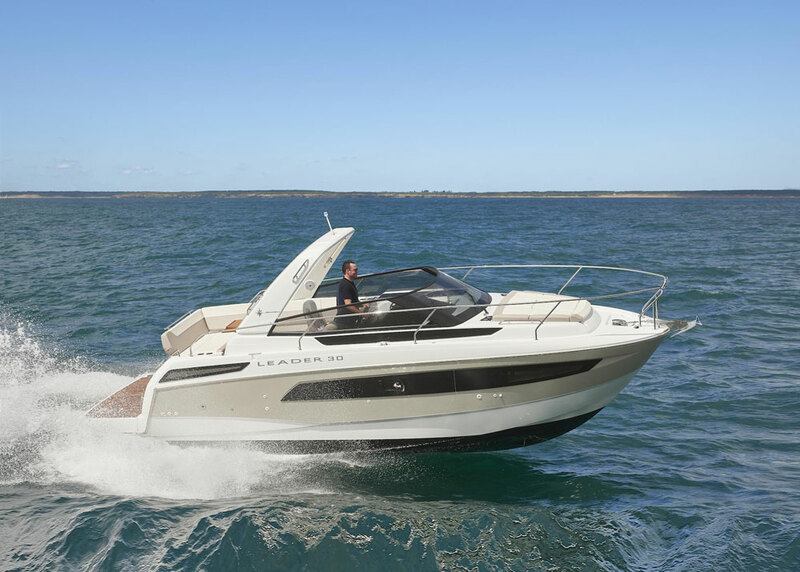 Introduced in 2015, the Leader 36 sits near the middle of Jeanneau’s express boat range, joining its Leader 8, Leader 40, and Leader 46 sisterships. Like a lot of Jeanneau’s powerboats, the Leader 36 taps into design elements seen on the company’s aforementioned Prestige luxury motoryacht range. The Leader 36 has an angular and chiseled look, but gains some elegance from a gracefully arched (optional) hardtop and sophisticated reverse sheer line. Lots of teak and a contrasting bronze and white gelcoat scheme round out the Leader 36’s good looks. Outside spaces are a key focus on express boats and something not neglected on the Leader 36. Aft is a sprawling swim platform covered in teak with plenty of room for staging water toys or a dinghy. A step-and-a-half up from the swim platform and through a swinging stainless-steel door in the transom is the bridge deck, covered in more teak decking, with lots of places to sit or lie down and relax. The bridge deck sits underneath an expansive cabintop, half of which slides back electrically, opening up the area to the sky. The transom features a large sunpad with convertible qualities. Move a few bolsters around and the area becomes an aft- or forward-facing lounge with backrest. Or shuffle things a different way and you’ve got a completely flat and comfy place to work on your base tan. The whole assembly lifts up on gas struts to expose the Leader 36’s mechanical and engine spaces. This convertibility is something Jeanneau has engineered into many of its models, and we’ll see more of it as we step down below. If you’ve ever cruised on an express boat with another couple—or your kids, for that matter—you already know that most similar boats under 40 feet often lack an enclosed, private master stateroom. 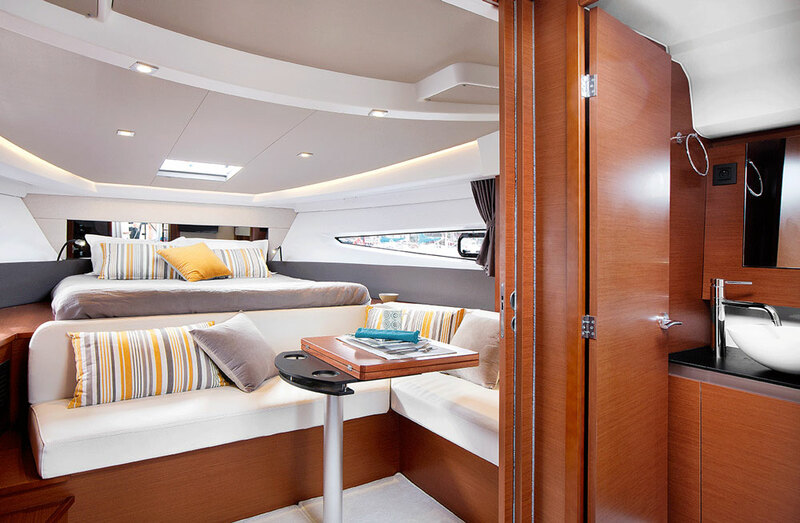 The master is either tucked away midcabin under the bridge deck without so much as a bulkhead or door, or it's designed in as part of the main saloon with only a curtain to provide “privacy.” Neither is a great option. Once you’re below on the Leader 36 you’ll find access to the midcabin stateroom located aft and to port. It has a pair of twin berths that can be converted to a just-under-queen berth with a filler cushion. There’s standing headroom back here with a dressing bench and hanging locker and—you guessed it—the cabin is completely secluded and private, with its own door. In the bow of the boat is a queen-size berth and just aft of it is an L-shaped dinette, which is shared with the main saloon. This creates the illusion of a master stateroom that’s completely open to the main saloon. But simply pull in a couple of sliding doors, and the area becomes completely private and shut off from the rest of the boat. Presto change-o—a set of slide out bulkhead doors create a private enclosed master stateroom in a snap. The two staterooms share an enclosed head and shower that’s located to starboard, and a more-than-adequate galley is off to port. Our review craft’s galley was fitted with a two-burner stove, sink, microwave, and an incredible amount of stowage tucked away in strategic locations. Headroom is ample as well, and the interior feels open and spacious, thanks to lots of hullside opening ports and long portlights. We ran the Leader 36 on a slick-calm autumn morning on Chesapeake Bay, with the added bonus of having the twin Chesapeake Bay bridges as a picturesque backdrop. Standard power on the Leader 36 is a pair of Mercruiser 300 MAG 5.7-liter gasoline inboards with Bravo III sterndrives. 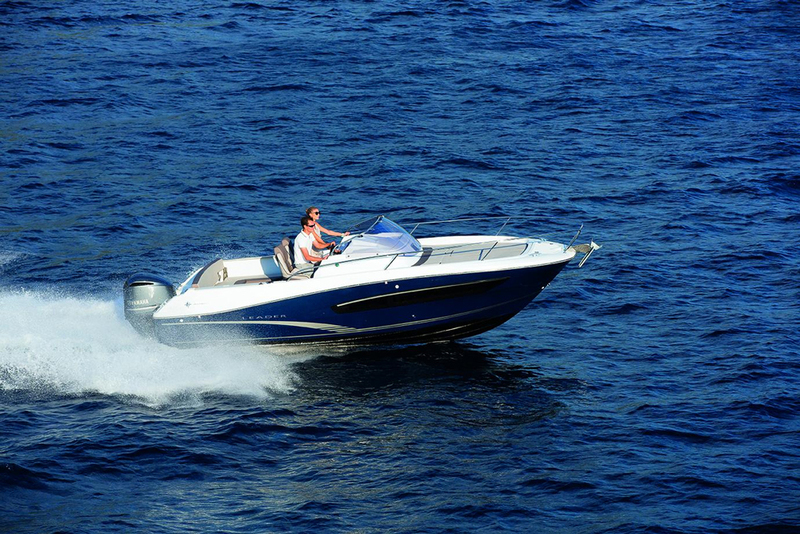 Our test craft was fitted with optional twin Volvo Penta D4 300 HP turbo diesels mated to Duoprop sterndrives and Volvo’s joystick steering system. It’s a pricey $46,900 upcharge from the Leader 36’s $275,000 starting price, but worth it for folks who want the ultimate efficiency and docking control. Another power option is a pair of Volvo Penta D4 260 HP diesels, also with Duoprop stern drives. The joystick steering system provided accurate and precise control as we shimmied our way out of a tight slip and into the marina fairway. Clear of the no-wake signs we added ever-increasing amounts of throttle until at wide-open we were blasting across the Chesapeake at 32 knots. Fuel consumption was around 30 gallons per hour (GPH) at this speed. We nuzzled the Leader 36 back a bit to calculate an efficient cruising speed and found that most people will likely want to cruise between 14 and 21 knots. Here you’ll enjoy lean fuel consumption between 13 and 17 GPH, respectively. Cruising range at 15 knots is around 170 nautical miles. Though we didn’t have sufficient waves to test the Leader 36’s sea-keeping abilities, she had a smooth, stable ride and great handling in the turns. We only found a couple of minor items on the Leader 36 that we felt were worth slight point deductions. We couldn’t help but notice a bit of hardware rattling of various cabinet components underway. Fortunately, a few rubber furniture bumpers from your local hardware store should solve this problem quickly and inexpensively. The aft engine hatch also felt a bit unsubstantial and creaked in the corners underfoot. Not a huge deal, but worth a look if you find yourself in purchase mode. All in all we found the Jeanneau Leader 36 to be an extremely well thought-out boat with lots of clever features, privacy for couples cruising, and efficient and powerful performance. Folks looking for an express boat in the under-40-foot range would be remiss in not including the Leader 36 on their shopping list. 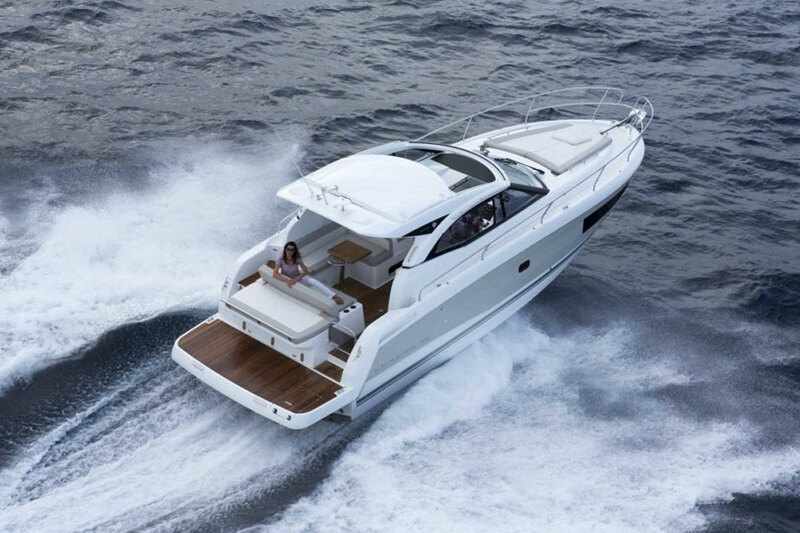 Other Choices: The Beneteau Gran Turismo 35 also has slick looks, good performance, and an enclosed mid cabin, though not with standing headroom. 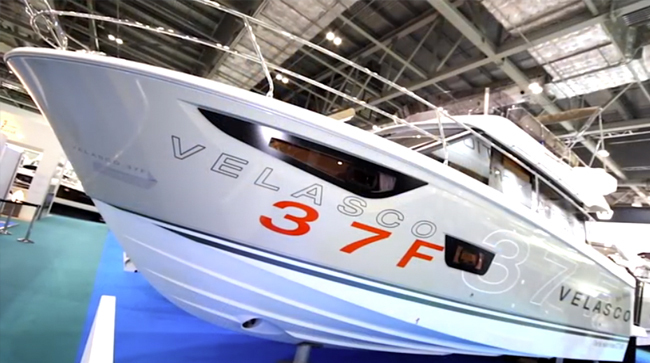 A slightly larger model that may be of interest is the Regal 38 Express. 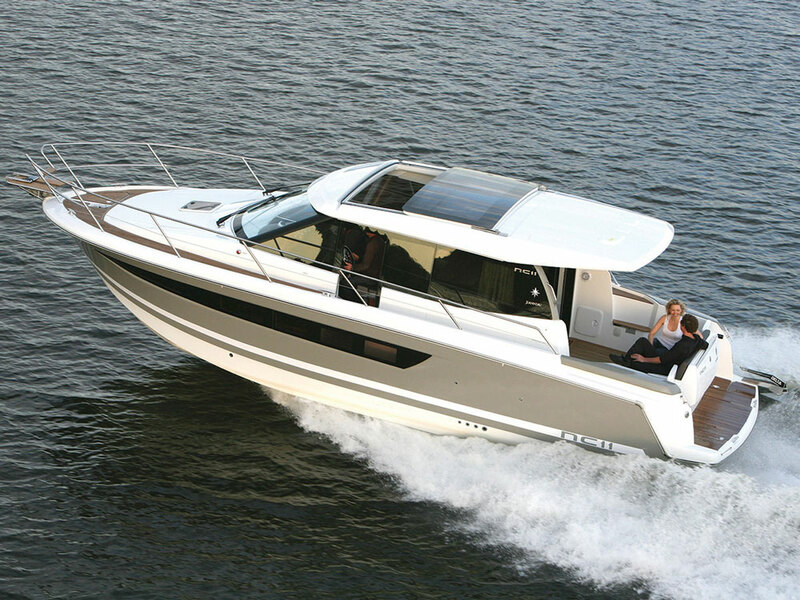 For more information visit Jeanneau, or watch our Jeanneau Leader 36 First Look Video.